The Web 2.0-related books listed below may be a bit old, and some of the links in them may no longer work. But the ideas and most of the information in them will still prove useful. There are even more free resources available to subscribers of the Digital Education newsletter. Sign up now and receive a free 'cheat sheet' containing 70 kinds of blog post. If you're stuck for content, this could be the answer! If you have already downloaded this book, what do you think about it? In the first week of this book’s being published on the internet it was downloaded at least 6,672 times! Here’s what people have been saying about it. This is one of the best collaborative resources I've seen on Web 2.0. It covers everything from wikis, blogs, to digital storytelling and podcasting. Terry Freedman the creator does a masterful job of organizing the content which has been included from such high esteemed educators from around the world, such as: Kim Cofino, Silvia Tolisano, and Shelly Terrell. What fascinates me so much is how easy it is to use this great resource. The content is organized in such a clean/precise way. I’ve had the pleasure of getting to know Terry Freedman over the past couple of years. Full of friendly, down-to-earth wisdom combined with aspirational thinking. Terry recently gave a video lecture/Q&A with the IT trainees on the PGCE programme - which went down really well. So really good to see Terry’s new publication, The Amazing Web 2.0 Projects Book! This update to an earlier publication is full of practical ideas, tips and experiences. At £10.00 it’d be a steal, at £FREE it’s a no-brainer. A great resource. Thanks Terry – great work. Andy Hutt Terry’s done it again – The Amazing Web 2.0 Projects Book! His Coming of Age, an introduction to Web 2.0, was downloaded at least 60,000 times when he stopped counting. Many of us used it as an early tour book for the opportunities a new Web presented. Terry Freedman just completed editing, with the help of what seems like a cast of thousands you likely already follow (or should follow) on Twitter, another lovely free ebook--by practitioners, for practitioners. Terry hopes The Amazing Web 2.0 Projects Book - will give readers an incredible insight into what teachers around the world are doing and using. I can't wait to dig into these ideas with our faculty! Any teacher with an interest ineffectively reaching every learner in his or her classroom–with meaningful, accessible, and engaging learning activities–would do well to take a look. The book is well organized, with activities categorized according to the general age range of the learners involved. All ur hard work in collecting, organizing & publishing Amazing Web 2.0 Projects book is VERY appreciated http://bit.ly/czGcpB I loaded it on my Kindle and have been enjoying the wonderful project ideas. Thank you, Terry for all the hard work and thank you to the contributors for their project ideas! I just found "The Amazing Web 2.0 Projcts Book" - Awesome collection of web2.0 uses. Thx! This is a great book to download for free! It's pretty light and breezy, but the information is well-structured (using a template that identifies things like age ranges, applications used, reactions and outcomes) and the content is clearly and well written throughout. There are some great technology projects included. Terry does a nice job of organizing the content, which has been included from educators around the world. Here is a great discovery- The Amazing Web 2.0 Projects Book by Terry Freedman. Thanks for making this wonderful resource available, Terry! As you think about the technologies we discuss each week, this can provide some good examples of how they are currently being used by real teachers. … a wonderful compilation of case studies. If you’re looking for ideas, this is an excellent book in which to look. Terry Freedman provides a nice compilation of 87 classroom projects using Web 2.0 technologies. The projects listed in the ebook are quite interesting and almost all contributors stressed the benefits of using Web 2.0 technologies in their teaching activities. However, these projects - and all current Web 2.0-based classroom projects - share a common emphasis on how to best integrate the emergent Web 2.0 technologies into the learning process without influencing the traditional pedagogical principles and policies imposed by formal educational institutions. Terry Freedman's "Amazing Web 2.0 Projects Book" is now available for download, free of charge…. Packed full of innovation and inspiration, you'll find examples of over 80 fantastic projects, plenty of applications, resources and tips on how to manage a successful venture in the online world of 2.0 and learn how your pupils can benefit. For lecturers who are interested in examples of how Web2.0 tools have been used in primary and secondary school, a really good resource has just been just published by Terry Freedman. 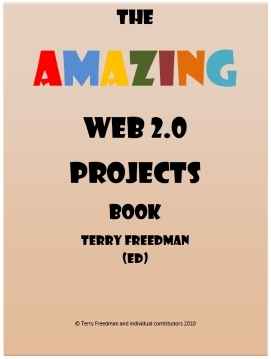 Terry Freedman has put together an excellent, free, book entitled "Amazing Web 2.0 Projects."…. This is a great resource for any teacher. The projects can be easily modified and there is so much other information and links to help educators come up with their own projects. I recommend this to any teacher, especially teachers who are just starting to use Web 2.0 technologies. There was so much stuff to take on board at NAACE last week, but one of the gems was to talk with Terry Freedman about his updated projects book. If you want some inspiration and ideas from around the world – just check out this resource and it’s free! This is a must for those who hearing a lot about Web 2.0 but not sure where to start. love it!!! great projects shared and will take awhile to explore them all! Fantastic publication! Wow, Terry, what a valuable resource and what a hard work you've done! Thank you, thank you, thank you! Congratulations Terry. Shows the quality of your great work. This is fantastic. I have bookmarked and I am sure to take a look at some of your ideas. Convinced you should have this book? It's free! luv it! The collaborative project is amazing. the lay out, the diff reference sections & ease of use R brilliant. gr8t job! It comes with a wide range of links that you can use – however the value is in the support ideas that are provided – with links, reactions, and the challenges that teachers and students might expect to have to overcome. Have you seen this? I printed it out this morning and firstly it seems like my holiday reading is sorted and secondly I cannot believe it is free. Terry Freedman’s wonderful FREE ebook is definitely worth a read . Isn't it great when information is FREE? Obviously we library folk agree with that philosophy. You can also follow Terry Freedman on twitter- he is very influential and well-thought of! Kathy Schrock's weekly email update provided this book which can be downloaded from the Educational Technology Site – ICT in Education. Provides a comprehensive listing of web 2.0 tools which teachers have incorporated into their curriculum. Today this posting is for those of you who like everything in one place! The Amazing Web 2.0 Project Book. Terry Freedman has collected a ton of practical, useful, and pedagogical ways to utilize Web 2.0 tools to support teaching and learning in this no-coast, downloadable publication. I've used a number of his ideas...he is definitely tuned into 21st century skills for both students and teachers! Take some time to check it out...I think you'll like what you see ! It’s those rare events when I come across a package that compiles a large number of activities/units with real school examples. Terry Freedman created Amazing Web 2.0 Projectsas an ebook which you can download. Included in the resource are web addresses that you can check out, challenges of the projects as well as tips for success. What a find! Janet Chow, Ideas to tweak your thinking, on her 21st Century Communities of Practice blog. I’m a avid follower of Terry Freedman (@terryfreedman) and I totally hated myself for missing iCTLT2010 and a chance to attend his concurrent session, Introducing Web 2.0 Into Your Classroom. Good news is Terry recently released an ebook The Amazing Web 2.0 Projects Book. Best of all, it is free! Kwan Tuck Soon, The Amazing Web 2.0 Projects Book by Terry Freedman on his Education Soon To Be blog. ... before I start to look in detail, I want to say that you should get hold of this book. It is better than anything else around. Jack Kenny, The Worth of Free, on Merlin John's Agent for Change website. Note: lest I be accused of misrepresentating Jack's views, I should point that he was somewhat critical of some aspects of the book. However, he did say, twice, that you should download the book! Are you sure you know what’s really meant by Web 2.0? By the time you get well into Terry Freedman’s new (and free) e-book The Amazing Web 2.0 Projects Book you will, I guarantee, regardless of your previous level of understanding, be much clearer about what it can mean for schools and learning. What Terry’s done here is put together a large collection of projects from teachers. Many of them are works in progress. All make fascinating reading. They’re deeply educative and – as when we’re presented with the painstaking work of serious-minded early years learners – often quite moving. Terry has done a fine job collating and editing this volume. Cool resource....If you teach writing or responding to literature, this resource will provide you with dozens of way to allow students to integrate technology to communicate their ideas. By taking advantage of free, widely available technologies, you can encourage your most reluctant writers while allowing your more gifted students to stretch their limits. Keith Schoch's How To Teach A Novel blog. Hats off to British educator, Terry Freedman, who has solicited lessons from 94 teachers from around the world and edited them into a free downloadable book. ... Terry's project is a great example of how the internet can be harnessed to share and collaborate. Fantastic book for all teachers. Terry Freedman has done it again. He has put out a new book - The Amazing Web 2 Projects Book. This book is free and has many ideas for the busy teacher. The best thing is all of these ideas come from teachers globally so that there are some really great ideas. These teachers have been trialled the projects so you know that they are going to work.